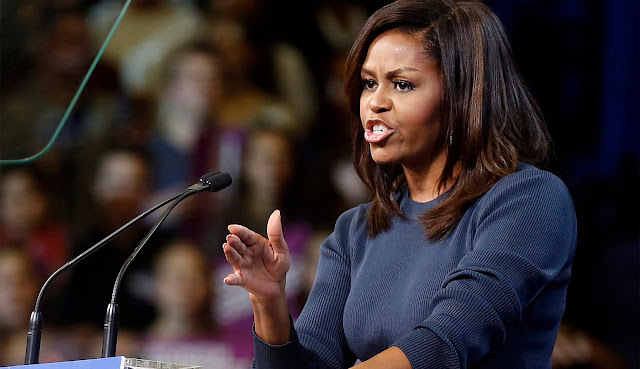 The massive 170,000 plus conference, Dreamforce, put on by Salesforce, will feature Michelle Obama as the keynote speaker. Salesforce CEO Marc Benioff will also introduce keynote speakers such as "actor & humanitarian" Ashton Kutcher, Girl Scouts of the USA CEO Sylvia Acevedo, NBC Today Correspondent Jenna Bush Hager, Global Health Corp Co-Founder & President Barbara Pierce Bush, and YouTube CEO Susan Wojcicki. What most of these speakers have to do with sales is hard to understand. It strikes me as an indoctrination camp for Cultural Marxism. This year’s Dreamforce will be its most inclusive & sustainable event to date. This includes gender pronoun stickers, gender-neutral bathrooms, mother's rooms, multiple skin tones of microphones available to all speaker. Are there really 170,000 saps, or their companies, that would pay for this? The conference runs November 6-9, here in San Francisco.